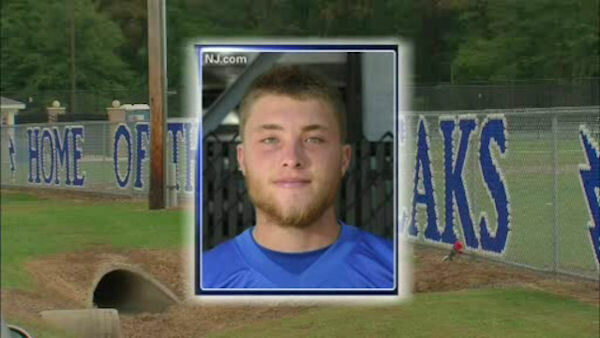 WASHINGTON TOWNSHIP, N.J. (WABC) -- A funeral was held Thursday for a New Jersey high school quarterback who died of massive internal bleeding after being hurt in a game Friday. Evan Murray, 17, was a star QB for Warren Hills Regional High School. Private funeral services were held at 11 a.m. Thursday at Faith Discovery Church in Washington, N.J. A wake was held Wednesday night, and many community members attended. Murray's teammates wore blue shirts and black ties. A few came early, but planned to practice before attending the wake, some saying that was the way Evan would have wanted it. The medical examiner said the cause of death was "massive intra-abdominal hemorrhage due to laceration of the spleen." "During the examination, Dr. Suarez determined that the spleen was abnormally enlarged thus making it more susceptible to injury. There was no evidence of head trauma or heart disease. The manner of death was accidental." Murray had walked off the field with the help of some teammates Friday night after taking a hit in the backfield. A short time later, the three-sport athlete collapsed on the sidelines and died at a hospital. School officials say the football team will continue its season Saturday when it hosts Voorhees High School in a game that was initially scheduled for Friday night. The matchup was also supposed to be the homecoming game for Warren Hills, but those festivities have been postponed. On Monday, the parking space that Murray usually used was filled with balloons and flowers. His name and uniform number were written in chalk on the space.